All systems appear to be “go” for this weekend’s big bash. With a little luck, 70,000 people will drop in for some fun in OB this weekend. The organizing committee for the 30th Annual Ocean Beach Street Fair & Chili Cook Off had their final meeting Monday evening at the Ocean Beach Main Street Association offices on Bacon Street. Over 240 vendors will be spread out along Newport Ave, with a few spilling over onto cross streets. Over 36 artists and bands will perform on five stages scattered throughout the festival. Here’s the lineup. You’ll be able to pick up programs for the festival (including a very handy map) at OBMA booths located along Newport Ave.
**Cars will be towed on Friday evening/Saturday morning from the Festival Area. If you need to find your car, call Western Towing @ (858) 273-8542. There are PLENTY of signs around OB warning you, so be careful! **Lost & Found—Including Lost Kids—will be at the OBMA Booth located at Bacon & Newport. Unruly children will be given a Red Bull and a candy bar…just kidding. ** NO C-NOTES! Due to a counterfeiting ring that has been extremely active in the OB area, the OBMA is advising vendors not to accept $100 bills. ** A preview of WAVES, the first all-OB music compilation. It’s up today, elsewhere on this blog. ** SHOW ME THE MONEY Part One. A look at the way monies are raised for this festival. ** SHOW ME THE MONEY Part Two. After the bash, we’ll tell you where it gets spent. ** HOT STUFF! A preview of the Chili Cook Off. ** MORE HOT STUFF! Actual coverage of the Chili Cookfest, provided by the OB Rag correspondent deemed to have the strongest stomach. ** ROCK N’ ROLL DIGEST. Ongoing coverage of as many musical acts as we can fit in before the beer takes over. ** RIDING THE TROLLEY. Things you should know, plus views and interviews posted from the comings and goings of the crowds during the day. ** ARTISTS ALLEY. We’ll be posting stories about the festival within the festival that usually gets ignored by other media. Included will be coverage from Haley, our “Youth Correspondent”. ** ARE WE HAVING FUN YET? We’ll have coverage of the goings on in Vendorland, in businesses along the street and all the sideshows that are such a big part of the Street Fair. ** IS IT OVER YET? I’ll be hanging with the volunteers and committee members throughout the day, reporting on the trials and triumphs of what it takes—behind the scenes—to have 70,000 of your closest friends over for a little party. For more information about the festival, visit the official web site here. 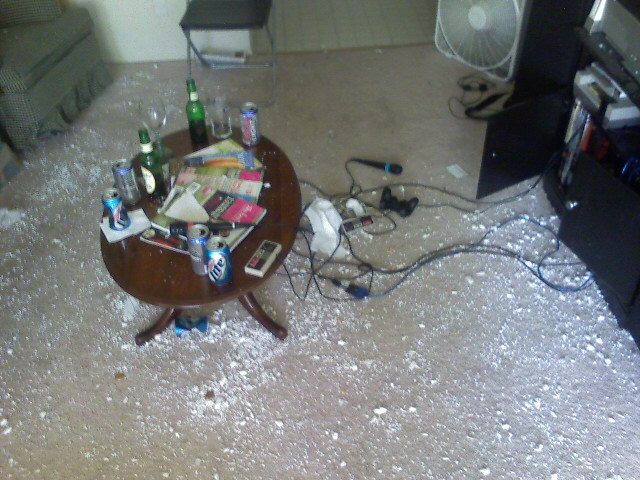 Doug has assured me all that white stuff in that top photo is ceiling material shaken loose by all the dancin’. Chili – Beer – Pepto – Beer – Dance – Beer – Gyros – Beer – Beer – Dance – Pepto – Beer. Pretty much have my day planned out. Not sure how great the coverage will be after happy hour though. I will have my camera in hand, but it is trained to only photograph women…oh hot women sorry…….. If anyone has any special interest or issue they would like the OB Rag blog to cover during the Fair, let us know. And Jim G – keep to the Sunsets, dude. Good morning! 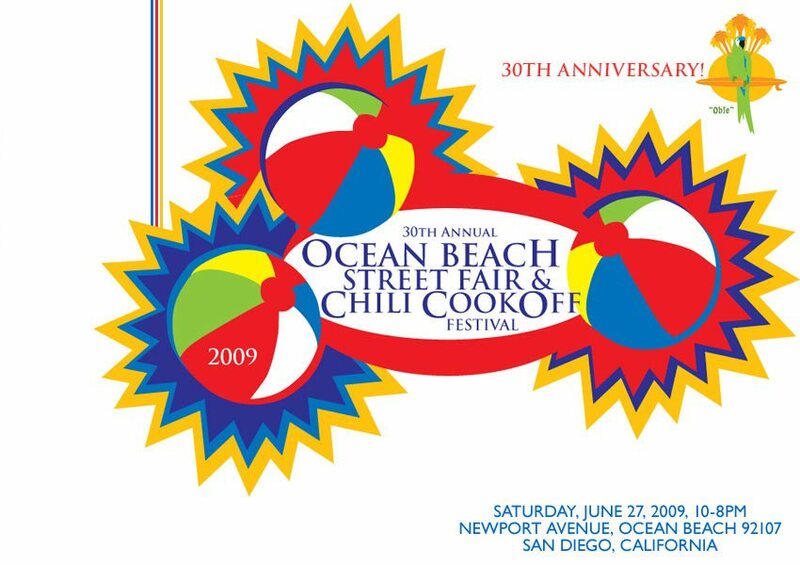 Just wanted to say thanks to OB for having Skirt Alert play at 3pm on the Community stage (OB Surf & Skate Stage on Cable). what a lead-in! this should be a great time. We have one videographer on board – Shane or “shizzyfin” I believe you know him as and if there are any others who are planning to shoot, please contact me (obevents@oceanbeachsandiego.com). Along with our other Social Media endeavors I want to start gathering cool footage of OB. Also, please stop by and say hi and be nice to all the sponsors of the Fair. Without them, we’d have a hard time throwing this party and then subsequently having fireworks on the 4th of July. Thanks very much!! I love Twitter…even CitySearchSD has retweeted the link to this article in the OB Rag! Looking forward to a killer time and matching killer write-ups y’all! Keep the Red Bulls away from my kid! Going to try to get her tuckered out with all the early festivities and walk her over to Gramma’s house for naptime so me and Mama can play in the afternon! Please, someone video Skirt Alert at 3pm @ the Community Stage. I would love to get ahold of a copy and I will give you full credit. Thanks in Advance! I wonder if any of the bands will be playing any Michael Jackson covers in memory of the king of pop? I’m surprised as to how slow the internet was to pick up the M.J. story, I looked for almost an hour on Google and Yahoo and couldn’t find a thing. RiP Mr. Jackson.